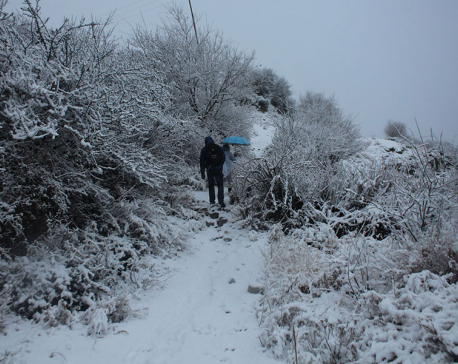 POKHARA / MUSTANG, Feb 11: Thick layers of snow frozen hard due to drop in temperature following heavy snowfall during the past week have made life increasingly difficult in various Himalayan districts of the country. 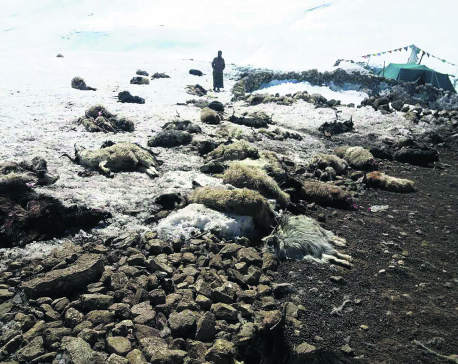 Manang and Mustang are among the districts that are heavily affected by such conditions. Frigid temperatures and the frosty weather in the districts have prevented the recent snow from melting. In Mustang, local authorities estimate that it would take at least a week for the frozen snow to melt. The Meteorological Forecasting Division (MFD) has attributed the recent snowfall to westerly disturbances, which started from Thursday and eventually affected most parts of the country. Strong winds blowing from the north have added to the woes of the affected areas. People are struggling to get back to their normal life. The weather phenomenon has cut off Manang from communication networks since the past two days. Deputy Inspector General (DIG) Dan Singh Bohara, who is the chief of Gandaki Province Police, said the cold weather is to be blamed for disruption in communication networks. The snowfall had continued until Saturday morning in the region. 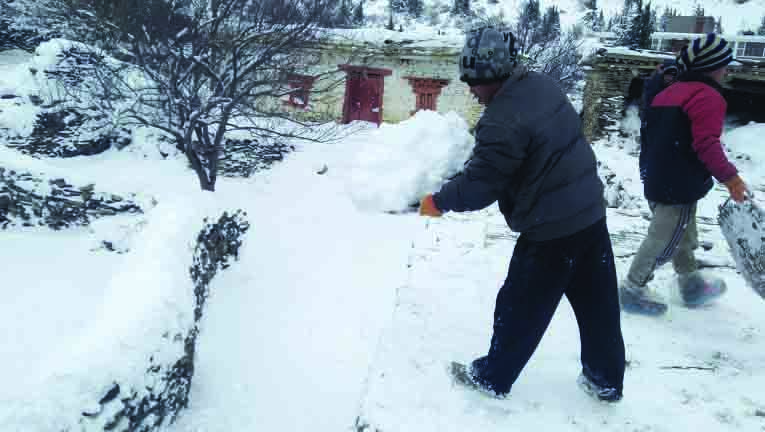 Mustang's headquarters Jomsom and its surrounding areas also have been covered by thick layers of snow that are yet to melt. Superintendent of Police (SP) Mahendra Khadka of Mustang said seven sumo jeeps left Jomsom for Beni of Myagdi on Sunday morning. “However, none of these vehicles have managed to make progress due to the frozen snow layers on the road,” he informed. According to him, the temperature has remained consistently low although the snowfall stopped. Jomsom's temperature in morning and evening reaches around -7 degrees while in the afternoon the temperature, when there is sunshine, reaches -1 degree Celsius. District Police Office (DPO), Mustang, informed that they are not able to remove snow from the roads because the snow has turned rock hard. They said that with the available equipment, they were able to remove snow only from part of the road where it wasn't very hard to remove. As the snowfall stopped, the residents have started clearing snow from their roofs by using household equipment. They have made the move as it would take a long time for the snow to naturally melt off from their roofs. 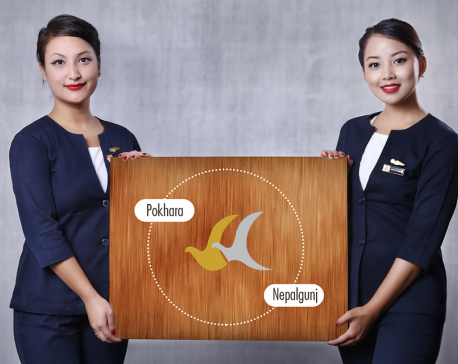 Likewise, Pokhara-Jomsom airlines service has also been halted for the past four days. Bhanu Bhakta Koirala, chief of the Jomsom Airport, informed that they are unable to resume the service as the snow has not cleared from the airport's runway. “Thick snow measuring around one inch has hardened on the runway. In some areas of the runway, the thickness of the snow measures up to six inches. Nepal Police and Nepal Army made attempts to clear the snow but much of the efforts went in vain,” he said. The airport informed that they cannot only clear surface snow and leave behind the ground snow as it will only make the runway ground more slippery. According to Koirala, there is only one operational flight per day on Pokhara-Jomsom air route due to offseason. Now, even that single flight a day has not been operated since the past four days. Not just the snow, another major factor preventing the operation of airways service are strong winds. The winds blowing from the north since the past four days are twice stronger than in normal times. During normal times, winds in the airport area measured around 10 to 12 nautical miles per hour. However, presently the northerly winds measure up to 22 nautical miles per hours. Such strong winds are ideal for resuming the operation of air service. “The wind speed is twice the normal ones here. This type of wind speed is very dangerous and we do not operate flights in such conditions,” said Koirala. “Such wind speeds last for hours. It has also made life difficult for the locals,” he added.According to the MFD, the westerly disturbance that triggered heavy rains and snow across the country has weakened now. The weather system has started clearing up from Saturday night.